More Than 100 One-Dish Meals Packed With Plant-Based Power by Jackie Sobon, Founder of Vegan Yack Attack. I have heard of Jackie before this book came out. I’ve made some of her recipes from Vegan Yack Attack. Her style, imo, is tasteful without a lot of fuss. I got really excited when I received a review copy. Everything you can think of- in a bowl. Who doesn’t love bowl foods? Some of the best things come in a bowl: ice cream, dips, nacho’s etc. With school starting soon, Jackie has pretty much made back to school lunches and snack planning easy- or take the bowls to work, you will have a healthy lunch – you won’t even think about that evil vending machine. Vegan Bowl Attack has: Attack of the Vegan Bowls (a bowl making 101 if you will), Bountiful Breakfast Bowls, Lil’ Snack Bowls, Satisfying Soup and Salad Bowls, Enticing Entree Bowls, Damn Good Dessert Bowl, Bowl Essentials (this is the DIY section for dips, sauces and more). Listen to this: how does Mint Chocolate Chip Doughnut Sundae Bowl, Raw Apple Crisp Bowl, Summer Picnic Bowl, Cabbage Rolls Bowl, Upside-Down Shepard’s Pie Bowl, Mozz-Stuff Neatballs Bowl, Loaded Potato Breakfast Bowl sound to you? These are just a few I book-marked when I first glanced through the book. I know operation Cook Thru Vegan Bowl Attack needs to happen. Someone must organize that!! Has someone? Must look into that. Anyway, back to the real reason why you’re here. The Loaded Potato Breakfast Bowl. This is simple- as in great for a weeknight meal. Made in less than 30 mins, 1 pot ok 2 pots- as you need one for the gravy. This recipe will be one of your go to’s when you’ve had a bad day, or caught in the rain, or you just want comfort food. Potatoes and veggies with mushroom gravy- in a bowl hot and savory- you in warm pj’s, watching a good movie to unwind from the day. 6 ingredients- 7 if you count the oil and 7 for the gravy, plus pepper and cheese if you’re using. Enjoy- Give into The Vegan Attack Bowl!! it is the perfect breakfast food to serve your dad. I know firsthand that this bowl is a crowd-pleaser! To make the potato hash: Melt the coconut oil in a large pan over medium-high heat. When the pan is hot enough to make water sizzle, put the potatoes in. Cover and cook for 15 minutes, stirring occasionally. (Start your gravy now, if you can.) Add the onions to the potatoes, cover, and sauté until the onions become translucent. Lower the heat to medium and then add the tomatoes and bell pepper to the pan. Leave uncovered and sauté until the potatoes are crispy and cooked all the way through. Season the hash with salt and pepper. Wait until right before serving to fold in the arugula, so that it does not become too limp. Make the gravy at the same time as the potatoes if you can; I wouldn’t recommend doing it afterward, as the potatoes may get mushy when reheated. Coat a medium saucepan with 1 tablespoon (15 ml) of the coconut milk. Bring to a simmer over medium heat. Next, add the onion and sauté for 2 minutes and then stir in the garlic. Cook until the onions are almost translucent and then add the mushrooms. Sauté until the mushrooms have darkened and reduced in size. Sprinkle the cornstarch over the onion-mushroom mixture and stir until everything is coated evenly. Put the contents of the saucepan in a blender or food processor along with the remaining coconut milk, the nutritional yeast, and liquid aminos and pulse a few times for a smoother consistency. Pour the gravy back into the saucepan and bring to a boil. Lower the heat so that the gravy simmers. Stir or whisk every couple of minutes until it reaches the desired thickness and then season with pepper. Divide the potato hash among 4 bowls (don’t forget to fold in the arugula first!) and top with cheese shreds, if using, and the gravy. Serve immediately. Yield: 2 large or 4 small serving. *I was given permission to share the recipe and photograph. Jackie Sobon is the mastermind behind all the photos in Vegan Bowl Attack published by Fair Winds Press. To purchase her book click on the Link. Tell us, what is your favorite bowl? Dissolve yeast in warm water. Add the herbs and spices. Add flour and mix. I use a stand mixer because I’m lazy and don’t find kneading dough fun. If the dough is too wet, add a little flour maybe a tsp at a time, if it’s too dry add a little water at a time, again try a teaspoon. You will know be the feel of it. 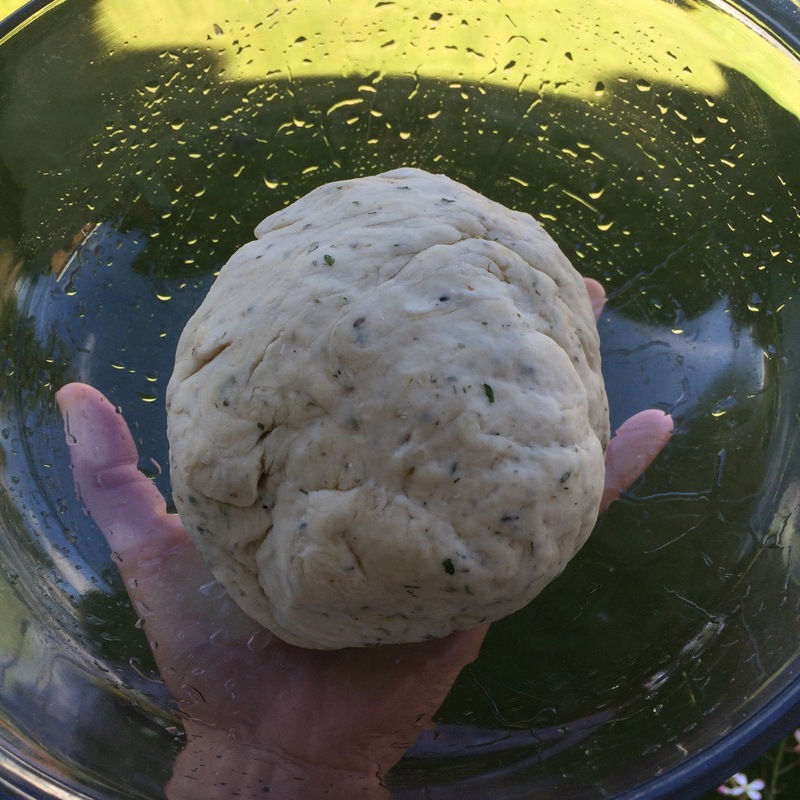 When the dough is come from the edges of the bowl, take it out and knead it a few times in your hand to shape it in a ball. Place dough in oiled bowl, roll the pizza dough around, cover with a clean towel (I don’t think I really need to mention that, but I did). Let it double in size. This could take an 1 hour or two depending on what type of yeast you’re using. 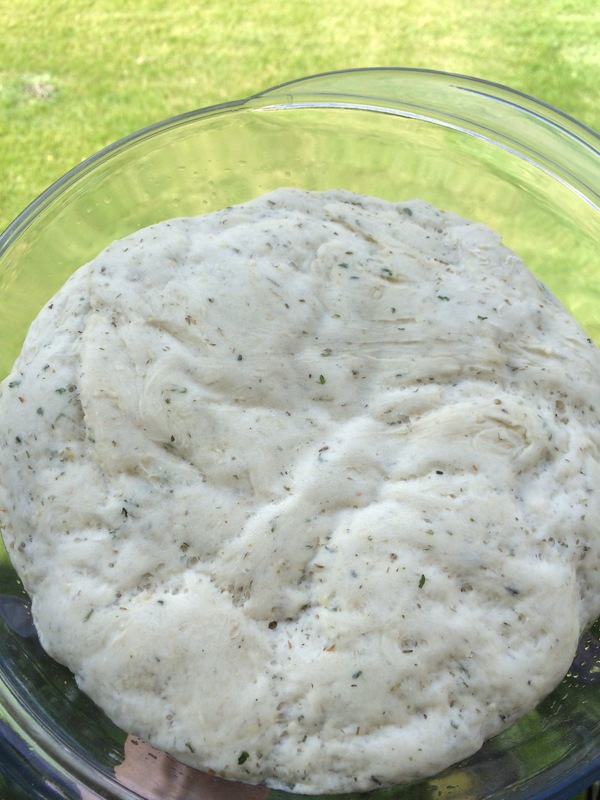 Do you like herbed pizza dough? Or do you like a clean slate and play with flavourful toppings? Wow, where did the year go? I have no idea, but what a lot of up’s and downs, tears not only of happiness but also of frustration, creative minds butting heads- but when everything is said and done- we can look back and laugh! We’re standing tall, stronger than ever! When Kayla and I first started the blog, we were only going to be talking about juicing, being mentally fit, and healthful eating. This was our journey we were going to share with you, and wanted you to join in on the fun. Looking back, we were (and still are) two like minded people who are still sharing a journey, but we are also on our own journey. We’re sorting things out, figuring out what we want to do: to write, to feature, to post. Kind of like parenting, we don’t always talk before we do something. Sometimes we agree to disagree on things. Don’t worry, we are sometimes mature 😉 and we won’t let anything stand in our way lol. We’ve been lucky to have worked with some amazing people who have written cookbooks, with publishers and with some of our favorite companies. Many of them I have tried before, but some were new to Kayla, so that were exciting when she fell in love with them as well. I don’t have any *one* favorite blog post; I have enjoyed them all for different reasons. We were able to interview a few people, write reviews and all of them are different, some just came naturally because it they were purely fun. I remember writing one review when I was extremely stressed out but I needed to get that review up and running as I was a part of a blog tour (those are fun) and hoped like heck that my life didn’t come through in the piece- that book is simply terrific and it needed my attention like any other project I’m working on. We’ve been able to host giveaways, which let’s face it, how fun are those? I want to figure out how to share a slideshow of the past year, it would be awesome to see everything we wrote. Kind of like a face book “take a look at what’s happened in the past year” thing. If I was a better blog parent, I would’ve had something prepared for today. But I’m not. Don’t worry something will be worked out, it’s just not going to be today. I just wanted to thank everyone from the birth and beyond- a HUGE thank you 🙂 Stayed tuned for more reviews and giveaways, we’re not done yet. We’re going to be doing some pretty epic things. Happy birthday 2 Flirty Girls and a Juicer, and Kayla Happy Anniversary- here’s to many more!! Luv ya to the moon and back! By the way, you owe me a tea 😉 Just because, don’t question it (I can read her mind hehe). Can I make a little toast? Can we get a little close? Can I get a hell yeah? That’s all I have. lol, a little Friday fun. What snack make you loose control? Oh, and the photo credit for the picture of the Plentils that says chips with benefits goes to the fine people over at Plentils. A new National Food Day. I’m all for National Food Days. So it should come as no surprise that I take part in such fun. Hey it helps plan dinner, snacks or drinks. Aug 15 is National Lemon Meringue Pie day. It also happens to be the birthday of Julia Child, the mastermind behind Mastering The Art Of French Cooking. I got to thinking about Annie and Dan and all the fun things they get up too. For those who have not heard about The Shannons, let me fill you in on them. They decided to veganize recipes from Betty Crocker, and The Betty Crocker Project was born (they go into more detail on their site, you should read the full story). In 2015, their latest book came out called Mastering the Art Of Vegan Cooking, in honor of Julia Child. Even though I love a good lemon meringue pie I’m going to declare Aug 15 as Meet The Shannon’s day, maybe Annie and Dan will make me a pie? This day will also celebrate Julia as she has inspired millions of people around the world. I think you should visit the Shannon’s website and make something from there, or make one of Julia’s recipes vegan. Try the Vegan Bacon Ranch Smashed Potatoes or some vegan beer and cheddar bread? Let us know what you decided to cook up. I “borrowed” the image from amazon, until I can take my own photo.